Most of you probably fish tandem rigs for panfish, the most popular being the popper/dropper rig. With a popper/dropper rig, a nymph or wet fly is tied to the bend of the hook on the popper on a 1-4 foot piece of tippet. This allows you to present two options to the fish simultaneously, one on the top and one fished lower in the water column. While it is a deadly set up to use once the water warms up, it will not be of much use to the early season angler. 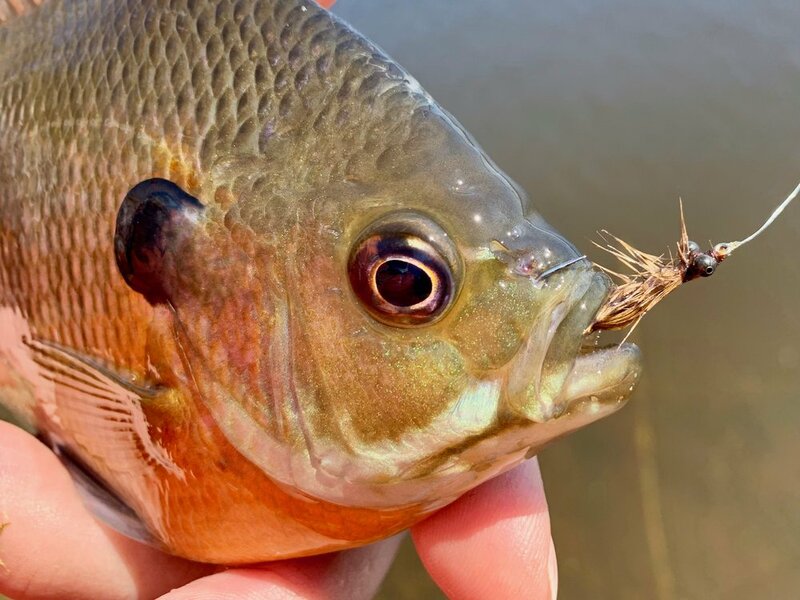 In late winter and early spring bluegills and other panfish are reluctant to take a top water offering. When they do, it is likely to be a minuscule midge imitation, not precisely the right choice to suspend a weighted nymph underneath! The tandem rigs I fish during the early season are wet fly rigs. During this time of year, before the fish enter the shallows to begin scoping out areas to build their beds, they tend to group up on the drop-offs on the edges of the shallow water. In the unstable weather of early spring, they will enter the shallows on warm sunny days and retreat to the deeper water during periods of colder weather. It is a crap shoot this time of year, it all depends on the weather. Some days the fish are on the shoreline, others they are noticeably absent. The good thing is when they are not in the shallows I know where to find them. During a recent outing a surprising number of fish took the larger pattern. That is usually not the case. When the fish are holding deeper, you need to get the flies down to them. I do occasionally use sinking and intermediate lines, but as we move closer to warmer weather, I am usually equipped with a floating line in anticipation of the season's first topwater bite. To get flies down under these conditions I will fish a tandem rig with two flies. One fly will be large and heavy to bring the small unweighted wet fly down to the fish. Although I will catch the odd fish on the larger fly, most will take the smaller wet fly. An added benefit to this method is that the larger fly often attracts the attention of larger predators like bass. 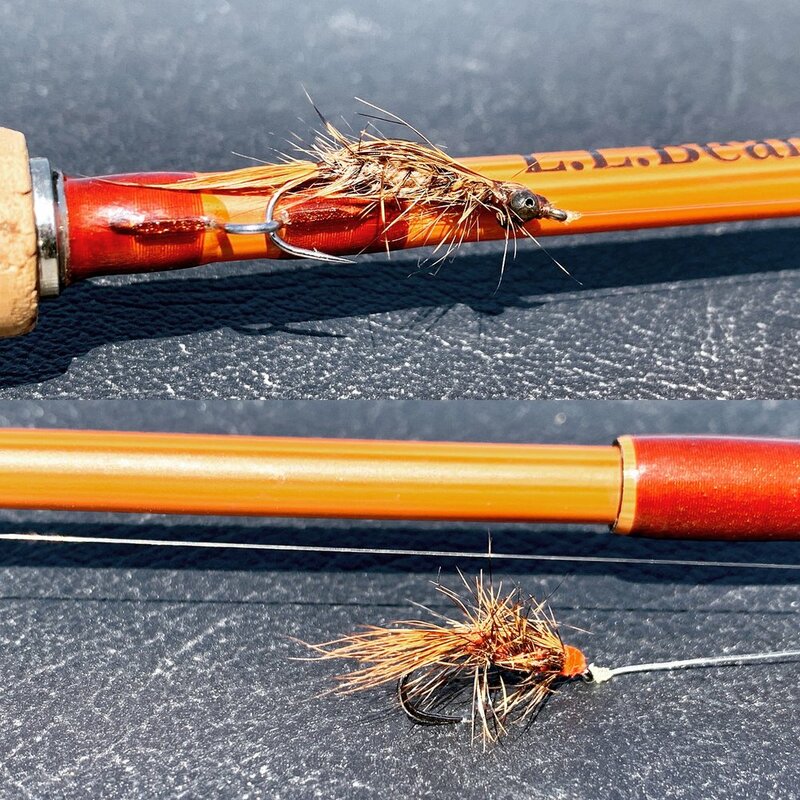 On a recent outing, I rigged up with two versions of a fly called a Spring Wiggler. The Spring Wiggler is a Michigan Steelhead pattern that I have scaled down and adapted for use in warm water. The Panfish Wiggler version is tied on a size eight hook and sports a set of heavy bead chain eyes to get the fly down deep. The unweighted smaller version goes along for the ride. It proved to be a deadly combination. The Spring Wiggler, pint sized for panfish! This one has a “well chewed” appearance, always a sign of a good day on the water! In the body of water I was fishing I could reach a deeper section of the pond with a long cast. This area often holds fish when they retreat from the shallows during cold snaps. What was surprising was about fifty percent of the fish took the larger fly. That is often not the case. What was also surprising was the number of doubles that were caught. The fish were much more active than I had anticipated even though the water was cold and they were not in shallow water. The first double of the season! You have several options for setting up a tandem rig. Many folks tie the second fly off the bend of the hook of the first one. While I do that occasionally, I prefer to attach the first fly on a dropper off of my leader. As long as you keep the dropper short (under three inches), you will never have a problem with tangles. I sue a triple surgeon knot to create the dropper with my fly being tied on the tag end pointing away from the rod tip. I feel this method gives a more natural presentation. Whether you put the heavier fly on point (the end of your leader) or the dropper depends on the conditions. When I am fishing with a real slow retrieve, I tie the heavier fly on the dropper. For more active retrieves I tie it on in the point position. In this position, it looks like the larger fly is pursuing the smaller one and this sometimes excites fish into striking. You can clearly see the dropper arrangement in this photograph, the heavier fly was tied on point. Don’t use tandem rigs only for popper/droppers. Try a tandem wet fly rig and enjoy some quality early season fishing! If you want to learn more about the flies mentioned in this post click on the buttons below.